To receive your Member Discount, enter the special VIP code below. This popular event is back in 2019 for two nights! Enjoy a Victorian extravaganza put on by our good friends at Bindlestiff Family Cirkus. 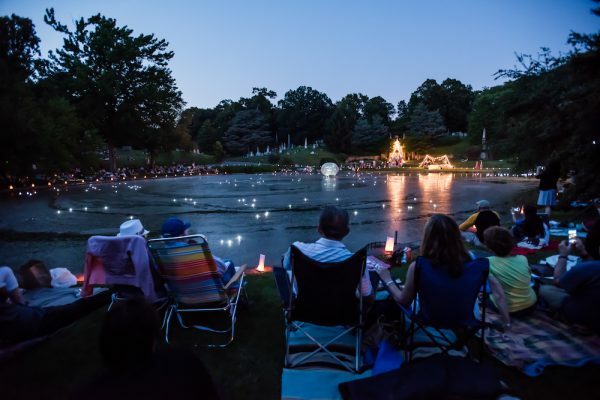 Begin the evening with a picnic (bring your own) around beautiful Crescent Water before being dazzled by nineteenth-century showmanship: fire eaters, musicians, contortionists, performers on floats, and much more—all under the starry summer skies. The evening celebrates Green-Wood permanent resident William Niblo, whose Niblo’s Garden was one of New York City’s largest and most elaborate theaters of its time. Author Benjamin Feldman reprises his role as the man himself, Mr. Niblo. Picnics welcome, but no coolers or outside alcohol permitted. Refreshments, wine, and beer will be available for purchase. VIP tickets are $70 for members of Green-Wood and BHS / $75 for non-members. VIP ticket holders do not need to buy a regular ticket as well. Members, enter the VIP code when purchasing below to receive your discount. In the event of inclement weather and cancellation, tickets will be honored on Sunday, July 14. Click here for our inclement weather policy.